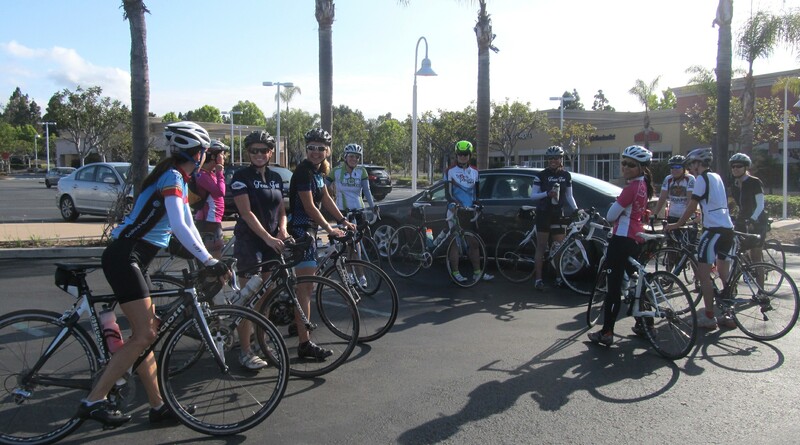 Saturday morning was blessedly beautiful and cool as 13 fun gals assembled in the parking lot in front of the Soup Plantation at Piazza Carmel Shopping Center off Valley Centre Dr in Carmel Valley for some two wheeled adventure. 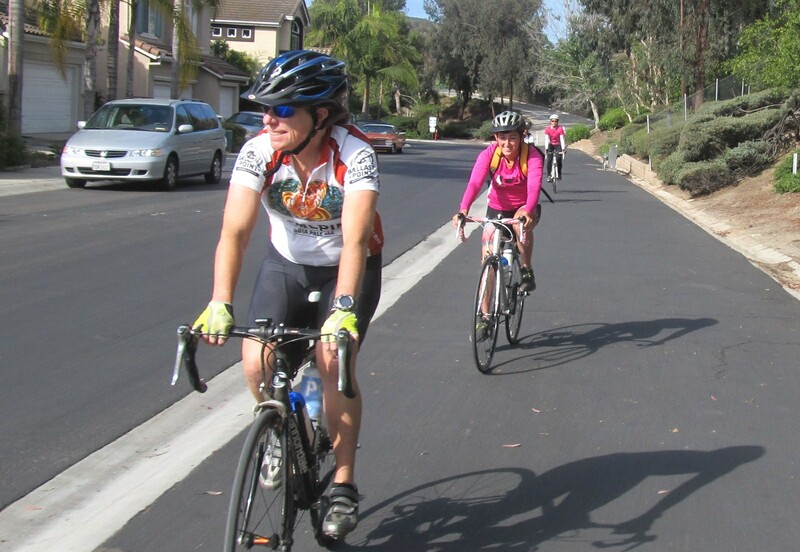 Seven went with Jill on the combined A/B group trek to tame Scripps Poway Pkwy climb to SR67, the hill known to locals as the Purple Monster; while four opted to stick with me on the mellow C group ride along the considerably less hilly out-n-back roll along SR56 bike path. Jill, flexing her flat-changing muscles before the ride. Fun gals looking forward to a fun ride! I’m afraid A/B group had quite a more interesting time than C group did. Vivianne forgot her cycling shoes and had to return home to grab them before catching back up with the group along the route, and Angela caught a front flat even before the ride start, which, of course, was the best time to flat at all as Jill and Michell (me) were all too eager to get some flat changing practice in. 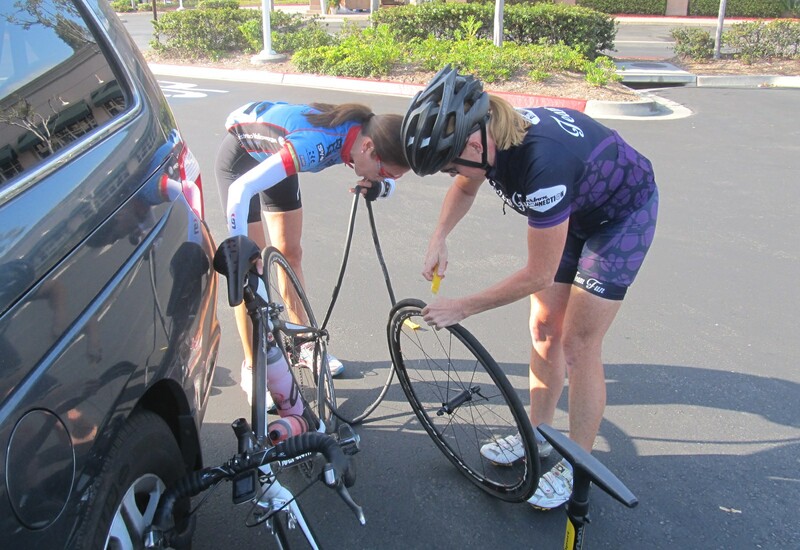 Alas, the other mechanical on the ride was quite a bit more complicated as A/B group was forced to leave Janice on the Carmel Mountain Ranch roadside with her chain firmly lodged between the bottom bracket and the small ring as well as between the spokes and the biggest cassette cog as they sped back to the cars to be able to go back to retrieve her. I guess this should remind us to always check all riding equipment the night before and also to always carry a chain breaker in our saddle bag (even if you don’t know how to break and re-connect chains, chances are someone will come along who knows how to… but they won’t be able to help without the chain tool). Courtney & Ruby were also having a fun time! C ride was quite event-free by comparison! We set out east at a good clip and managed to stay very much together. Near the east terminus of the SR56 bike path we picked up Chin, who had retired from the A/B group to ride back to Carmel Valley with us since her back was acting up a bit. Young April put in a good attack on the way back west and managed to stay away until the steep exit ramp on Tang Dr back to Carmel Creek Rd when the whole group was together again. 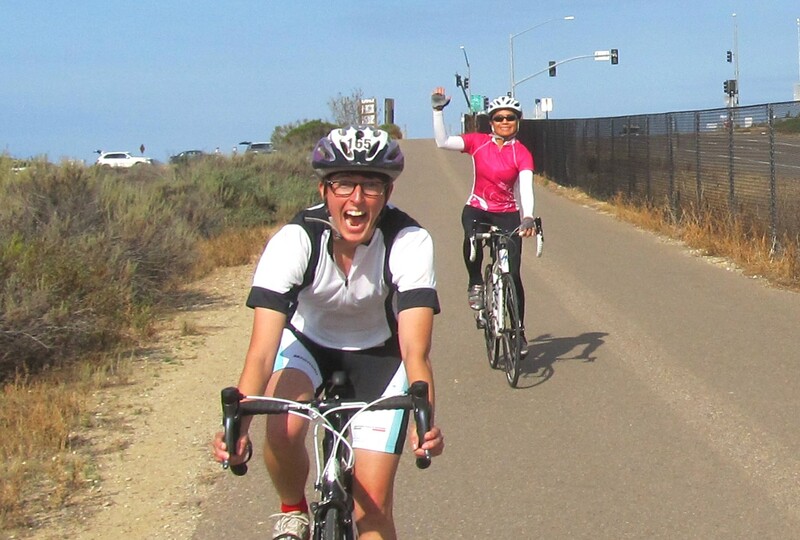 Everyone looked so fresh at the finish that four said yes when I asked if anyone felt like adding in five extra mile of sight-seeing loop to visit the awesome custom houses at the base of Torrey Pines Extension Park. 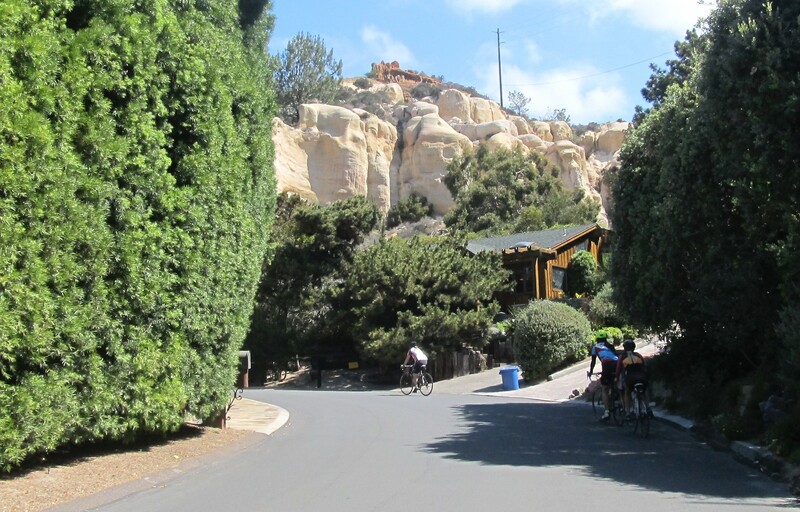 The Via Grimaldi – Via Latina loop just below Torrey Pines Extension Park houses some of the most spectacular homes in the county. There are no two like houses in Del Mar Heights! 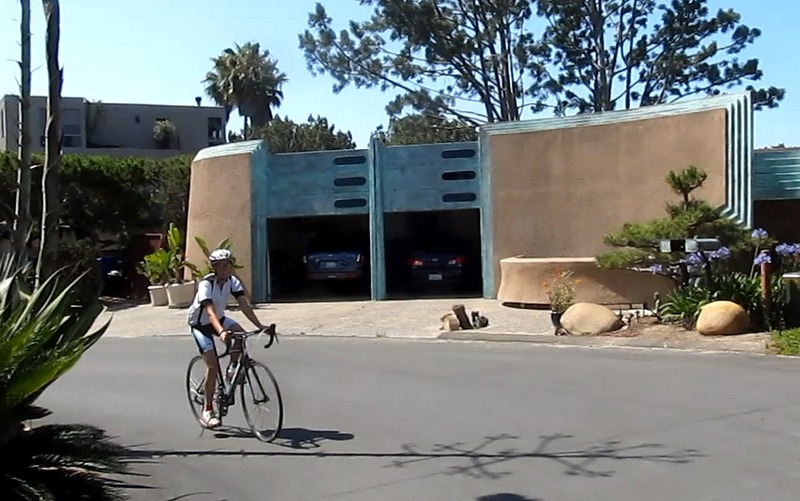 It’s a shame that most cyclists only whip through Del Mar along the Coast Hwy (Camino Del Mar) and Carmel Valley Rd without ever straying up the hill in between those roads. Del Mar Heights hides quite a bit of gems amongst its pine trees and coastal bluffs! Of course, you do have to pay a bit for the view when you visit by bicycle… but the climbing is quite short compared to all the wow’s we got to let out at every corner! 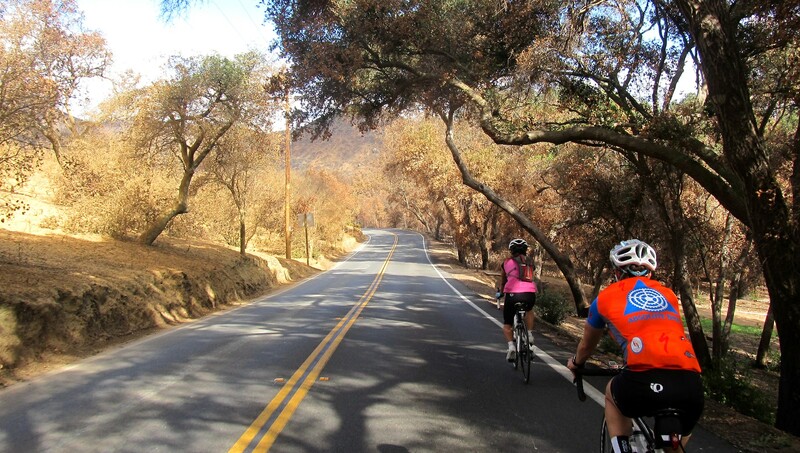 This Saturday (June 13th) we are starting in Carlsbad (the Ralph’s on Avenida Encinas) for the ever popular Elfin Forest/Del Dios Loop. The weather forecast is looking awesome and a ride can’t get more fun with Jill and Heather B hosting. Come out and join us!